“I’m having a little trouble understanding that they’re married,” my eight-year-old, Barnaby, says. We’re on the way to school and his comment comes out of nowhere, but I know exactly who he’s talking about. Our almost-nightly ritual involves one episode of Doctor Who before bedtime. This is my second go-round with the Doctor; my oldest child, Tallis, now 14, obsessed over the series a few years back and we watched them all. Tallis also read the books, bought the mugs, and still wears the trench coat. He even sported a bow tie for a few weeks. Now it’s Barnaby’s turn to love the show. 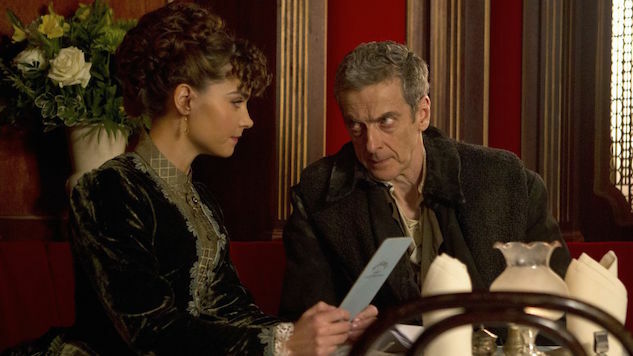 We’d watched the episode “Deep Breath” the night before, and he was puzzled by the relationship between Vastra (Neve McIntosh), the female lizard person left over from an ancient subterranean race who passes as a Sherlock Holmes-type figure in Victorian London, and Jenny (Catrin Stewart), the Watson character, who sports a bustle on her skintight pantsuit and wields a sword like it’s nobody’s business. These two characters had revealed their marital status and even kissed, though the meeting of their lips was explained by the need to share the oxygen in Vastra’s lizard lungs. “How can they be married?” B asks. My husband and I have always tried to be inclusive when framing the world for our sons. I am the embarrassing mom who, when she muses out loud about the future, says things like, “Do you think you and your husband or wife will live in the country or in a city?” We don’t treat being gay as being different. It’s just another way to be, on par with loving pickles or having blue eyes. So, I’m surprised that our youngest son thinks there’s something odd about two women marrying each other. He didn’t react at all when Captain Jack Hartness (John Barrowman) planted steamy goodbye kisses on both Rose Tyler (Billie Piper) and Doctor Who version nine (Christopher Eccleston). It’s tempting to look outside the home for answers to the question of why this boy has developed a discomfort at the thought of two women being married. Can I blame this on Donald Trump? When gay marriage was defended with a Supreme Court decision in 2015 and I mentioned the news to my oldest boy, he reacted with, “Wait—it wasn’t legal before?” The fact that a young teenager responded to the criminalization of marriage between two people of the same gender with incredulousness made me hopeful for the future of our society. But that was two years ago. President Obama was the leader of the country, and the First Lady was besties with Ellen DeGeneres. Now we have Donald Trump at helm. We have recurring, violent examples of hate, fear, bigotry, misogyny, and prejudice erupting all around the country. We have North Carolina! Oh, North Carolina. My husband and I try to limit our children’s exposure to these news items, but they seep through. Sometimes, I’m not quick enough to turn the radio away from NPR and onto music. The newspaper camps out on the kitchen table for days before I remember to toss it in the recycling. And they hear things at school. Information about hate is available for anyone with half a brain, and my dear boy is smart, he reads any print he finds in front of him and he remembers. He remembers everything. “I just don’t really… get it,” he says. “You understand that women can marry women and men can marry men, right?” I say. “No, I know,” he says. Oh. Turns out this wasn’t a teachable moment about gay marriage and accepting homosexuality. It’s a discussion about inter-species romantic relationships. That’s Doctor Who for you. Always pushing those boundaries. Andi Diehn is a writer and editor with an MFA in creative writing from Vermont College. She is the author of three nonfiction children’s books, including her most recent, Shakespeare: Investigate the Bard’s Influence on Today’s World.